Knights Opticians in Sedgley have been providing quality professional eye care since Rodney Knight first founded it in the 1960’s. 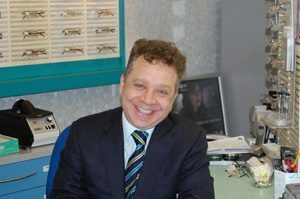 In the 1970’s brothers Costas and Michael Kakoullis, already with a long tradition in optics having practices in Oldbury and Halesowen, acquired Knights Opticians from Rodney, who was a close friend. It was not long before nephew Kekes and Gigis (son of Costas) joined the team during the 1980’s. The practice was originally situated on the opposite side of the road in Dudley Street, as some of our patients may recall, until we took the plunge and built to our own specifications on our new and current site. This enabled us to offer a greater level of service and care to our patients in our modern and comfortable environment. At Knights Opticians we continue to be committed to providing an excellent, professional and caring approach to eye care for our patients. Our friendly team are dedicated to provide you with the best standard of care possible. Kekes Kakoulli BSc. (Hons), MC Optom. Graduated from Glasgow College of Technology (now Glasgow Caledonian University) in 1983. During his pre-registration year Kekes worked at the Birmingham and Midland Eye Infirmary. Kekes enjoys all aspects of clinical work, working between a number of family owned practices in the Midlands area since qualifying. Dispensing Optician/Manager:Kikis Cacoullis F.A.D.O., M.B.A.C.P. Kikis Cacoullis FADO. Trained at City and East London College in Ophthalmic Dispensing and graduated in 1982. After which he spent 5 years as Dispensing Optician in London, both private practice and Newington Green Hospital before returning to the Midlands to the family private practices in 1987. 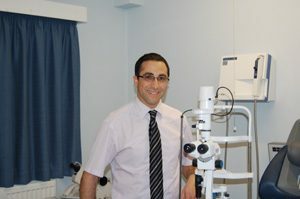 During the time since working at RT Knight Opticians, Kikis has concentrated on developing and updating systems and equipment and has made available the latest in spectacle lenses, frames and contact lenses. Maintaining his clinical development, more recently Kikis has undertaken the Diabetic Retinopathy Screening Course through Heartlands (East Birmingham) Hospital to support existing diabetic involvement at RT Knights.